WELCOME TO WORLD ASSOCIATION OF INTEGRATED MEDICINE! Integration means combination or unification. 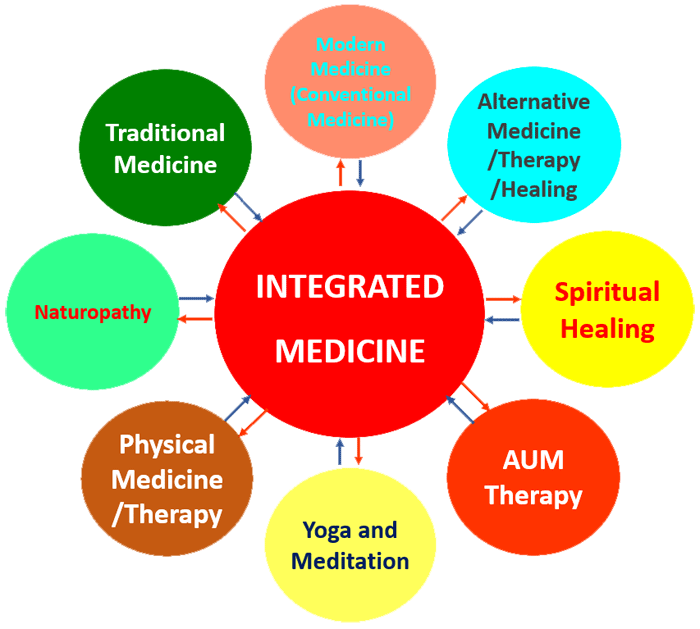 “Integrated Medicine is defined as combination or unification of the modern and traditional medicine / system / healing together for its teaching, training, treatment, research and national implementation on possible scientific parameters(As all aspects of traditional medicine / system / healing cannot be bind in strict scientific boundary). The best integration is the combination of all aspects i.e. principles, diagnostics and therapeuticsin one combination but it can also be done even in principles and or diagnostics and or therapeutics. (IFDIM – 1992). None of the medical system is perfect. None of the medical system is useless. Every medical system has merits and demerits. Our tradition is to respect all. Under such circumstances, the only answer is to take the best of all the available systems together and develop its teaching, training, treatment, research and national implementation which could be nearer to the perfect as perfect is only one i.e. Omniprence who is controlling the entire universe (Divine Intuitions, Revelations and Blessings of Sri Sathya Sai Baba).